Here’s your New England Patriots Fan Guide. Are you OK with your quarterback being called “GOAT”? Do you have an equal amount of admiration and hate towards Eli Manning? Has your favorite NFL team won five Super Bowls since 2002? You MUST be a Patriots fan! The New England Patriots are the cream of the crop of NFL teams and their fans are no different. With an iconic head coach and a superstar quarterback, Patriots fans are rarely disappointed with their team. Loyal fans stick by the Patriots during the lowest of lows (Deflategate) and the highest of highs (their remarkable Super Bowl comeback). To be a Patriots fan is to consider the preseason to be 20 weeks, think Tom Brady is the greatest quarterback ever, and know what a “Gronk Spike” is. Patriots Place is located right outside of Gillette Stadium and offers a variety of things to do. Visitors can shop, dine, and catch a movie. Boston is a city full of history. Take the day to discover the Freedom Trail or the Boston Public Garden. If you’re lucky, the Boston Red Sox may be in town. Catch a game in the iconic Fenway Park in downtown Boston. Visit the Samuel Adams Brewery for a behind-the-scenes tour and taste the best beer in Boston! The Hall at Patriots Place is an interactive New England Patriots hall of fame. Fans can look at Super Bowl memorabilia, see the Lombardi trophies, and try on Tom Brady’s uniform! We use the word “wicked” as a general intensifier. When we say “wicked pissah” that means something is really awesome. We change the TV channel with a “clicker”, put our groceries in a “carriage”, and pick up our alcohol at the “packie”. “Down cellar” is a term for our basement. Up in Maine, if you hear the word “ayuh” that means “yes”. The circles in the road that confuse a lot of people? We call them “rotaries”, not roundabouts. We eat “scrod” and “spuckie”. Scrod is a term used to describe any kind of white fish, while spuckies are long subs. Looking for something to do on the weekend? Why not hit up a “tag sale”? Others refer to these as yard or garage sales. What do you call the chocolate candies on your ice cream? In New England, they are “jimmies”, not sprinkles. When we are in the hospital, we wear a “johnny”, not a hospital gown. A “masshole” is a real term – It was added to the Oxford Dictionary in 2015. A masshole refers to some of Massachusetts’ crazy drivers. New Era Knit Cap – Temperatures are frigid in New England during the winter months, but fans and players can stay warm with this warm and fashionable knit cap. Tom Brady proudly rocks this cap on the field and during press conferences. Patriots vs. Giants – It’s been six years since Brady & Co. lost to the New York Giants for the second time in a Super Bowl game. Although some time has passed, players and fans never forget the heartache Eli Manning delivered to New England. The Patriots are constantly seeking revenge whenever the teams meet. Patriots vs. Colts – This rivalry is considered one of the most famous in NFL history. Between the two teams, they share six Super Bowl titles and nine AFC Championships since 2001. The rivalry peaked when Peyton Manning was still in the game and has died down a bit since Deflategate. But, with the Josh McDaniels drama, will the rivalry flame reignite? Tom Brady – The man, the myth, the legend. You’ll spot a lot of #12s around Gillette Stadium. Not only is it popular in Massachusetts, Brady came in #2 for NFL jersey sales in 2017. Rob Gronkowski – Everyone loves #87! Gronk also had a popular jersey in 2017 – He came in at #8 on the list. Randy Moss – Although Moss was only in New England for three years, fans love continue to love him and rock #81. Drew Bledsoe – Before Brady, there was Bledsoe. Despite losing his starting quarterback job to Brady, Bledsoe is still beloved in Foxboro. Stephen Gostowski – The Patriots kicker is rock solid and fans love sporting their #3 jerseys. When Will Tom Brady Retire? It’s hard to imagine the New England Patriots without their star quarterback, but Father Time is catching up to Brady. When he starts the season in September, Brady will be 41. Despite his age, Brady shows no signs of slowing down, but his famous wife, Gisele Bundchen, has made it very clear that she wants him to retire sooner than later. While Tom has previously stated that he would like to play until he’s 45, he’s recently hinted that this may be his last year. Is The Patriots Coaching Dynasty Ending? Tom Brady aside, fans are also concerned with the head coach position. Rumors have also been swirling that Bill Belichick is also on the way out. Offensive Coordinator Josh McDaniels was heading to the Colts as a head coach, but suddenly changed his mind and stayed in New England. Is he being groomed to take Belichick’s position? 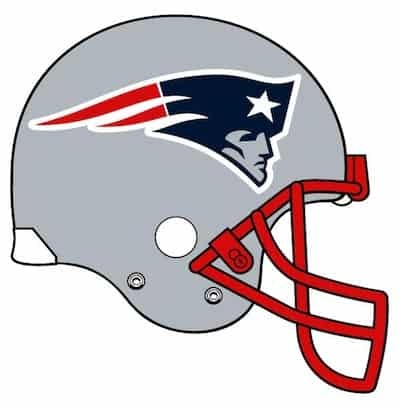 The Patriots began with a simple logo in 1960 – A tricorne hat. This was only used for one season and “Pat Patriot” took over. Pat was a Revolutionary War minuteman hiking a football and was the team’s official logo from 1961-1992. In 1993, the Patriots released a new logo – A gray face of a minuteman wearing a patriotic hat that fades into a flowing banner. Both this new logo and Pat Patriot are used on merchandise today. Ty Law – Law is considered one of the best Patriots defensive backs of all time. He was drafted in the first round of the 1995 NFL Draft and stayed with the Patriots until 2004. During this time, Law won three Super Bowls with the Patriots and was a part of their 2003 record-breaking defense. Despite being released in 2005, Law has represented the team a handful of times as an honorary captain and was inducted into the Patriots Hall of Fame in 2014. Tedy Bruschi – Inside linebacker Bruschi played in the NFL for 13 years, all of them with the New England Patriots. He is a three-time Super Bowl champion and was named NFL Comeback Player of the Year in 2005. Bruschi retired in 2009 and joined ESPN as a sports analyst. He has stayed close with the team and was an honorary captain at Super Bowl XLIX. Adam Vinateri – Vinateri was a household name throughout New England in the late 90s and early 2000s. The kicker appeared in three Super Bowls with the Patriots and holds the NFL record for 44-straight field goals made. The 45-year-old still plays for the Indianapolis Colts, the team he left the Patriots for in 2005. Vince Wilfork – 325-lb. Wilfork was a key player on the Patriots between 2004-2014. While with the Patriots, he was considered one of the best defensive tackles in the NFL and was named to the Pro Bowl four times. He also won two Super Bowls while in Foxboro. John Hannah – Hannah is one of the Patriots greats who didn’t play in the 90s or 2000s. Hannah was an offensive guard for the Patriots from 1973-1985. Hannah was named “The Best Offensive Lineman of All Time” by Sports Illustrated in 1981. Since playing, he has been elected to the Pro Football Hall of Fame and the College Football Hall of Fame. In 1999, The Sporting News named him as the second greatest offensive lineman in NFL history. Willie McGinest – McGinest was an outside linebacker for the New England Patriots from 1994-2005. He won three Super Bowls with the Patriots in 2001, 2003, and 2004. He had 78 career sacks with the Patriots, landing him #3 on the Patriots all-time sack list. The Patriots released McGinest in 2006, but he signed a one-day contract with the team in 2015 so he could retire as a Patriot. 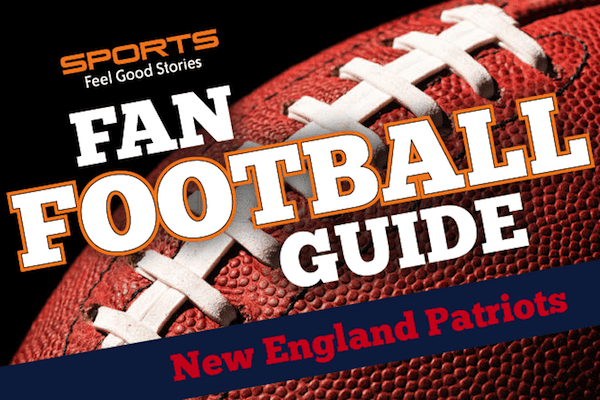 NOTE: If you have any feedback on our Patriots Fan Guide, please use the Contact Us page. Tom Brady – Ask anyone in New England – Tom Brady is not only the G.O.A.T., he’s their God and Patriots football is their religion. Brady was picked up in the sixth round of the 2000 NFL Draft and is considered the biggest steal in draft history. Brady has won five Super Bowls, four Super Bowl MVP awards, and three league MVP awards.Because of this, many people consider Brady to be one of the best quarterbacks of all time. And, oh yeah, he’s married to super model and successful business woman Gisele Bündchen. Check out Touchdown Tom’s alma mater: the University of Michigan Football Fan Guide. I can’t believe the season is almost here! Who is Hyped up??? Julian Edelman – #11 has been one of Tom Brady’s favorite targets since 2009. Like Brady, Edelman was drafted late (7th round), but has transformed into one of the best players on the team. Despite being benched with a ACL injury last year, Edelman is still considered a key player and will return to the starting lineup in 2018. Edelman serves as both a wide receiver and return specialist for the Patriots. Bill Belichick has been the head coach of the New England Patriots since 2000. Since becoming coach, he has led the team to 15 AFC East division titles, 12 AFC Championship games, and eight Super Bowl games. The Patriots have won five Super Bowls with Belichick as their coach. He currently holds the record for most Super Bowls as a head coach. Who owns the New England Patriots? Businessman Robert Kraft purchased the New England Patriots for $172 million in 1994. Kraft also owns Major League Soccer’s New England Revolution and Gillette Stadium. He is the chairman and CEO of the Kraft Group, a holding company not related to Kraft Foods. Belicheck Yourself Before You Wreck Yourself. And, if you’re blessed to have drafted the GOAT, check out Tom Brady Fantasy Football Names. Q: What do the Los Angeles Police Department and the New England Patriots have in common? A: Neither one can stop a Bronco. Where Do the Patriots Play? The Patriots play at Gillette Stadium, an outdoor venue located 28 miles southwest of Boston. The stadium, which is also home to the MLS’ New England Revolution soccer team, was opened in 2002. The seating capacity is 65,878 and includes 89 luxury suites. Due to its large size and easy accessibility from both Boston and Providence, RI, there are many other events held at Gillette Stadium. Gillette holds some home games for UMass football, large concert events, and hosted the 2016 NHL Winter Classic. Season tickets for Patriots home games have been sold out since 1994. If you’re interested in obtaining tickets in the future, you should join The List now. (This is a waiting list for season tickets.) There are perks for just being on The List, such as discounted merchandise and special ticket presales. For single games, try the NFL Ticket Exchange powered by TicketMaster. For group tickets – 15 or more people, try Vivid Seats. You’re on the New England Patriots Fan Guide.